Chan Kim remembers one of the best moments of his life. He was coming out of surgery and moved his hand near his stomach to feel for something foreign. Instead, he felt nothing. He was elated. Where he feared there may be a pouch connected to his body to collect his digested food, he felt just his torso. Nothing attached. 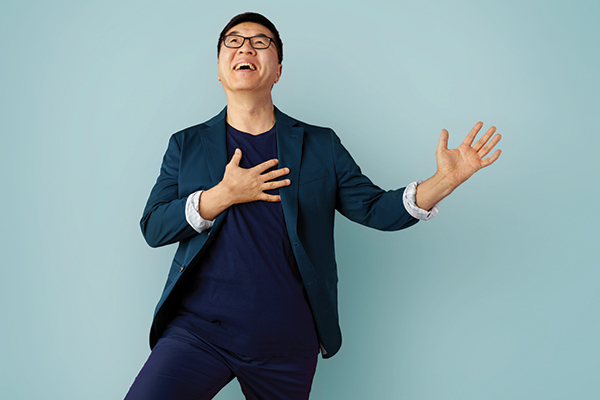 His complicated and difficult colorectal surgery to remove a cancerous tumor that had been missed by another hospital was successfully completed by Dr. Hee Yang, a general surgeon and the Medical Director of Asian Health Services at Holy Name Medical Center. "I was so very happy with Dr. Yang and Holy Name," Chan said. "I had a bag after my last surgery at the other hospital and was afraid I might need one again. But this time it would have been permanent." Chan, now 60, had gone for a routine colonoscopy screening soon after turning 50. A pre-malignant growth found during the test needed to be removed with a surgical procedure. Chan had the surgery in a neighboring hospital. Physicians there erroneously removed only a section of the pre-malignancy instead of the entire thing, Dr. Yang said. They also performed an ileostomy, a procedure that makes a small opening for the lower part of the small intestine to connect to an external bag for the body's waste. This is done to give the intestine time to heal. Chan had the bag for five months before a second surgery reversed the ileostomy. "He had undergone two surgeries, yet three years later another colonoscopy showed he still had the growth," Dr. Yang said. "Only now it had turned into cancer." "When they found the mass at my second colonoscopy, they recommended I go back to that same hospital," Chan said. "But by then I had heard about Dr. Yang and Holy Name so I went there." Dr. Yang performed the five-hour surgery to take out all the cancer without needing to do an ileostomy. "It was a very complicated surgery - there was a lot of scar tissue and it was in a difficult area to work," Dr. Yang said. "This should have never turned into cancer - I'm just glad I was able to do this so Chan didn't need a bag. Chan's cancer was stage 1 and was completely removed so he needed no further treatment. "I feel great," Chan said. "I'm so thankful to Dr. Yang and Holy Name. I am back to living my normal life and that wouldn't have been possible if I didn't get such great care."